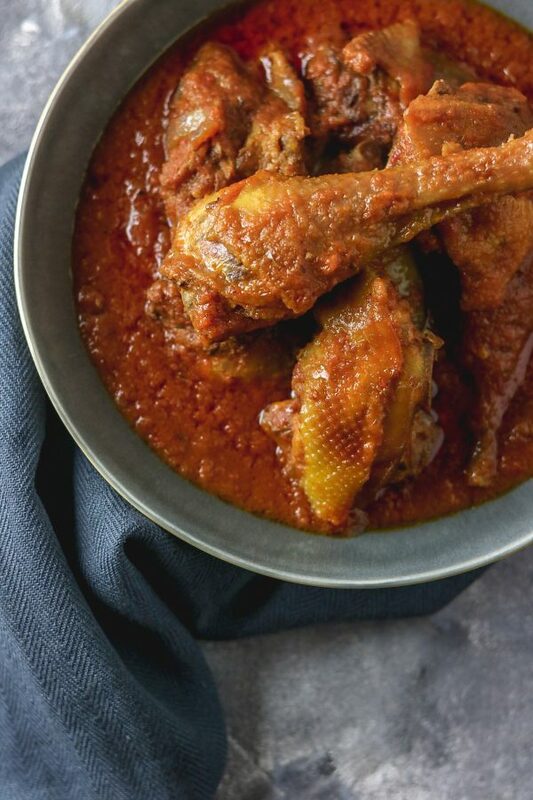 Nigerian chicken stew is loved by every Nigerian no matter where they reside. 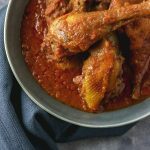 Nigerian chicken stew is a classic recipe and it is very delicious too. In my previous post, I talked about Nigerian pepper base, as this gives you the base to making most Nigerian stew or soup recipes. Nigerian chicken stew can be eaten with almost everything from boiled rice to soups and as a dip. Typically, the Yorubas would add this chicken stew to almost everything. Call it trust issue but yeah, that is the way we do it. There is no hard or soft rule to making Nigerian chicken stew, some people like it well fried while others like it light like Imooyo. As a Nigerian girl, I would say the majority would like theirs well fried or thick for intense flavour. 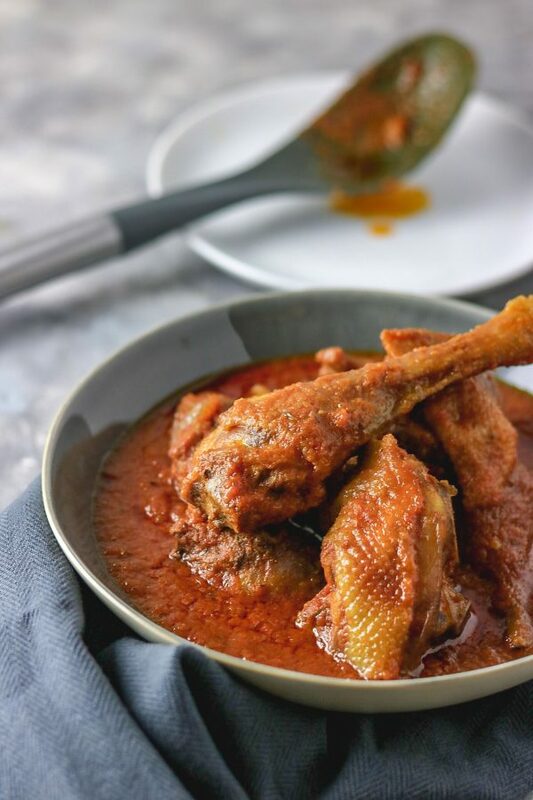 This classic Nigerian stew recipe is simple and you can use any kind of meat to achieve this too. I used a mixture of turkey and Chicken and I tell you, I almost finished my stew the same day. vegetable oil used in frying the chicken. (Use fresh oil to fry the chicken) except you are grilling. Nigerian stew is best cooked with vegetable oil. Curry and thyme may or may not be added to the stew although, it is essential you use it in cooking your protein of choice. 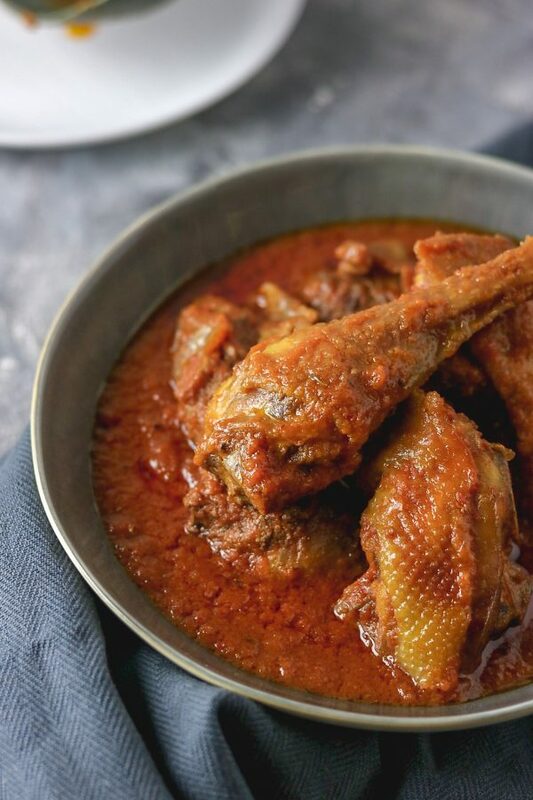 This is to achieve the authentic Nigerian chicken stew taste, full of flavour and depth. 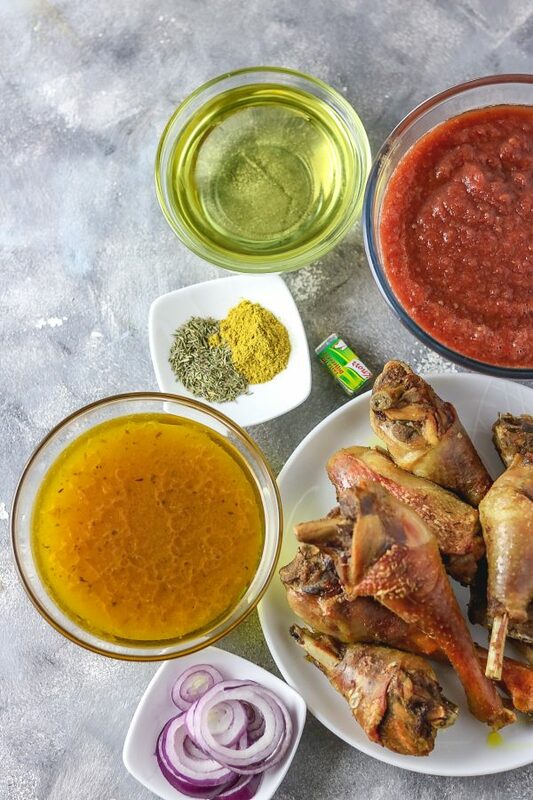 If for any reason you choose to use palm oil for this recipe, I would recommend you don’t use curry and thyme, as I believe this spice and herbs don’t work well with palm oil. This is my personal opinion and I haven’t been proven wrong about it. It can be enjoyed with anything, it is usually served with soup staples like ewedu, okra, all kinds of Efo and white rice. Let us get on to cooking this classic stew. 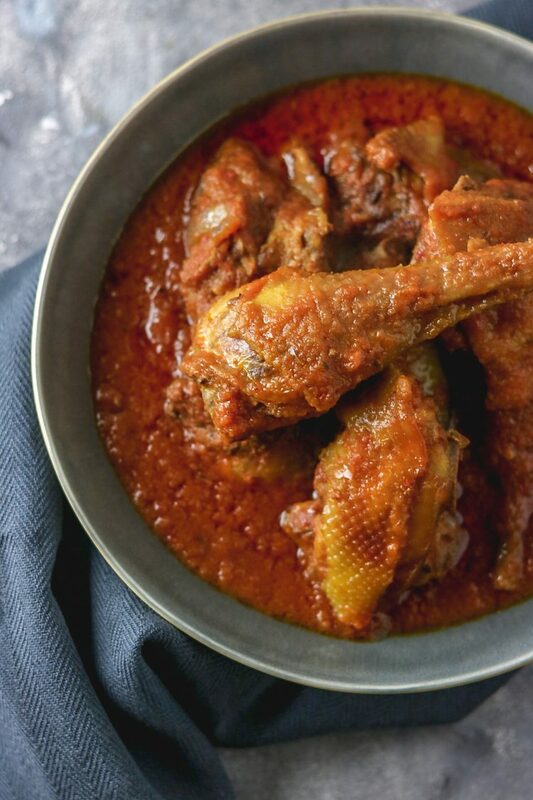 This is the classic Nigerian chicken stew. It is very easy to make and very delicious and this stew can be eaten with almost anything. 1 cup chicken broth This is the broth you get from boiling the chicken, this is optional if you opted for grilled chicken instead of fried. Rinse the chicken and place in a pot, Place the pot on medium heat, add ginger, garlic, curry, thyme, salt, 1 chopped onions, bullion cubes and water. stir together to combine and bring to boil till tender. Fry or grill chicken/turkey and set aside. Add fried or grilled chicken and continue cooking on medium heat till stew stops foaming and the oil starts flowing on top of the stew. Don’t worry if you see too much oil floating on your stew, you have done well. Simply scoop excess oil of the stew and keep it for some other dish or discard. Cooking this stew is pretty straight forward and the outcome is superb. I used Nigerian Knorr brand of the bullion cubes to cook this chicken stew, I didn't specify the amount that should be used as this can be used according to preference. If you haven't used or cooked this stew before, I would recommend you use 2 to 4 bullion cubes to cook the chicken, if you would be using the chicken broth, don't add salt or bullion cubes till you have tasted it and you are sure it needs more. There you have it lovelies, Nigerian Chicken stew in all its glory!. Wooow!! This looks fantastic Ajoke!!! I sooo want to eat this right now. Thank you so much for sharing your amazing recipe. I will be making this in few days. Wow, this chicken stew looks fantastic Ajoke!! I feel like eating this right now. I’m so saving your recipe!! Thank you so much for sharing!! May I ask for the quantities used for stock, tomatoes, water, seasoning etc pls as not all items listed shows quantities. Hi Chrissie, recipe updated and thanks for stopping by.